I have not sewn a thing in the last couple of days (unless attaching two button eyes to my polar bear block counts). 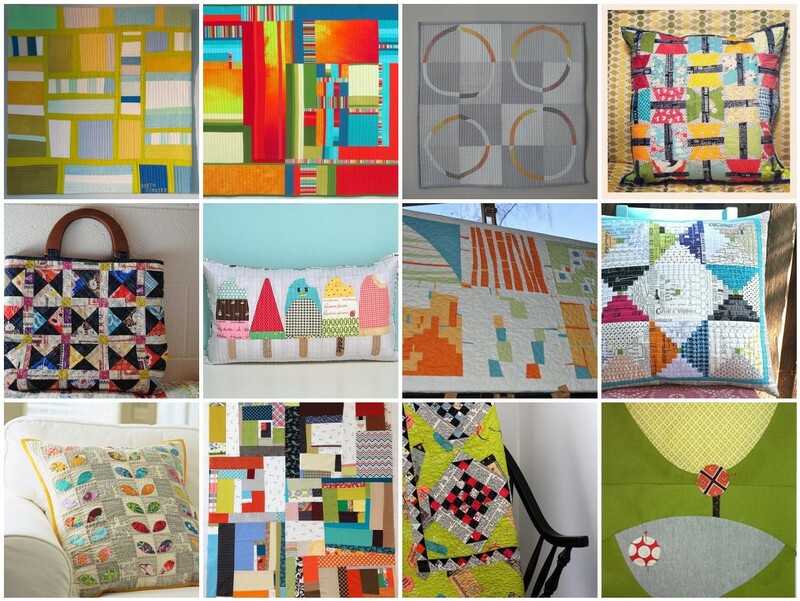 So, I thought it might be a good time to show you my churn dash quilt which I finished a while back. As I mentioned before, I made this quilt as a Christmas present for my FIL. I love the contrast of these very graphic, bold churn dash blocks and the crispness of Kona snow. I think it makes for a very "man appropriate" quilt. Aaaah, I don't think I can ever get enough Denyse Schmidt. I did straight line quilting in white thread about 1/2" apart. Every time I do this kind of quilting I'm amazed at the wonderful texture and feel of the quilt once it's washed and dried. It's so crinkly and soft, love-love-love!!! I used gray solid fabric (probably Kona gray) for the binding. It frames the whole quilt so well and adds just the right finishing touch. Finished size of this quilt is 48 " x 60". Last couple of days were good. I've been working my way through the list of Christmas presents for my family and it feels great to check then off as I go. And, since I felt all happy and on track last night, I decided to take a little break and worked on this paper pieced polar bear block instead. Isn't he the sweetest? He'll look even better once I find some good buttons for his eyes, of course. I used the pattern by Sonja (artisania) from the book Pretty in Patchwork Holidays. I'm also almost done with two pillows for my mom. She asked for orange, brown, and white colors with some touches of red. Wow, not my usual colors at all, so to come up with something I'd like was quite a challenge. Here's a peek at one of the pillows. I decided to go with simple patchwork and I think it's the quilting that's going to "make" this pillow. I did some paper piecing for the other one - pictures coming later. Speaking of paper pieced pillows, I never really showed you the pillow I made for Kristie in our swap. I used this tutorial and, as usual, I'm simply amazed at how perfectly seams match up when I paper piece my blocks. 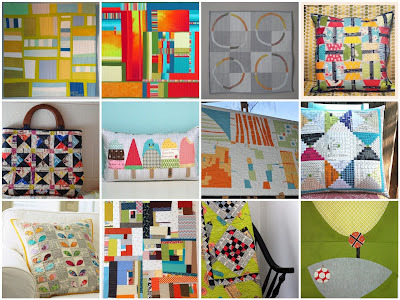 Once my paper pieced blocks were finished, I framed them with two borders, installed the zipper closure on the back, and bound the pillow as I would a quilt. Finished size of this pillow is 18" x 18". What have you been up to? Any Christmas sewing? I'm linking this post up to Lee's WIP Wednesday. See you there. Just 29!!! days till Christmas. Yay! I love Christmas, it's my favorite holiday and I love to get our house all festive looking. 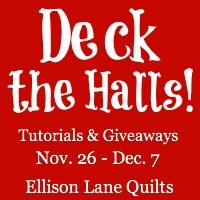 So, I was really excited and flattered when the wonderful Jennifer of Ellison Lane Quilts invited me to be a part of Deck the Halls! series. I hope you'll hop on over there and check out my tutorial for the Christmas patchwork table runner. And, to make things even more fun, I have a giveaway for you. Enter to win a $20.00 gift certificate to Sew me a Song by leaving one comment on this post. Mr. Random and I will choose the winner on Dec. 8th. UPDATE: This giveaway is now closed, thank you so much for playing along. And the winner is #117 Jenn who said: Wonderful table runner! Thanks for the give-away! Congratulations!!! I'm sending you an email right now. Hope you'll check out all the other wonderfully inspiring tutorials coming up over the next couple of days. Here's the line - up. 11/27: Live A Colorful Life / Giveaway from Zipit! 11/28: Petit Lyons /Giveaway from Zipit! First off, thank you all for the lovely comments and get well wishes you left on my last post. I'm finally feeling better and my sewing machine even got a little workout yesterday. It all started with this block of hexies. I enjoyed working on it, I loved the way it looked, and I had no purpose for it. So, this poor hexie block kept hanging out on my design wall, keeping company to a few other pretty blocks that I don't know what to do with. And then I came across Leila (Where the Orchids Grow)'s new make up pouch. That was all the incentive I needed to grab my hexie block, cut it up into smaller pieces, and turn it into a new pouch. Ta da! I used Ayumi's tutorial, just like Leila did, but I made a few adjustments to my pouch's size since I did not want to waste any of the hexies. The pouch I made is a little bit longer (about 10" long) which turned out to be a perfect size to fit my most used sewing supplies. Even my bulky rotary cutter fits in perfectly. And the seam ripper and a thimble will finally have a permanent home - no more looking for them every time I need one of them?!?! Now that would be something. I love how this metal zipper adds such a wonderful touch of finesse to the pouch. It is a little shorter than recommended in the tutorial, but I was dead set on using it. It still works, but it would have been better if it were just a little bit longer. Oh, well! there's always another time. What have you been up to lately? Do tell. Linking up to Amanda Jean's Finish it up Friday. You know how I was planning on making some place mats, right? Well, it seems I really, really wanted to make them because that's what I did right after I finished writing up my post. And then I got some very nasty cold + flu that kept me in bed, and not sewing at all, for 2 days straight. Totally going crazy here! So, I thought I'd just show you the two place mats I managed to finish. Hopefully more of them will be coming soon. This place mat was 100% inspired by the ones Chase made a while ago. I really loved all that improv patchwork combined with the white solid fabric she used, but I was being realistic here and decided to use darker fabric that will definitely be able to hide some stains. I first quilted the patchwork part - almost in the qayg style since I attached it to the batting and quilted. I then added the backing and the two dark strips around the patchwork and quilted those using straight lines. I really love how the quilting looks on the back, too. I then trimmed the place mat to 13" x 18" and bound it as I would a quilt, cutting my binding fabric to be 2" wide, instead of my usual 2.5" I use for quilts. I followed the same process for making the second place mat, too. Here it is, very similar, yet not the same as the first one. That's what I like about them. Wishing you all a wonderfully creative day. And to all my US friends, Happy Thanksgiving!!! I have yet another pillow to show you. Only this time I did not make it, it was made for me by the amazing Amber (One Shabby Chick) as part of the Pillow Talk Swap. and this dense straight line quilting that adds so much texture and interest to this pillow. I loved the pillow the minute Amber added it to the swap Flickr group. Of course, I had no idea it was for me as this was a blind swap. I kept looking at it and was so amazed at how much this pillow looked like my inspiration mosaic. Good sign for sure. And, to show you what I mean, here it is. This was definitely not an easy mosaic to work with, but Amber totally pulled it off. Thank you, Amber! You're a star and I'll treasure this amazing pillow forever. And here it is, getting to know its new "pillow family". I spent the last couple of evenings working on Christmas presents and by Sunday afternoon I was so happy with my progress, that I thought some "just because I feel like it"sewing was totally in order. I decided to make a new tablecloth for our kitchen table. I wanted to make something patchworky, but not too complicated. I found this simple tablecloth on Pinterest and got to work. I had no exact plan in mind, I just started digging through my fabric stash and went from there. This was such a quick and fun project. I used a flannel sheet, cut to the exact size as the patchwork top, for the backing. I placed both the top and the backing on top of each other (right sides together) and stitched all around, leaving about a 10" gap for turning. I then turned the whole thing right side out, pressed, and top stitched all the way around the tablecloth. I did no quilting at all as I quite like it being so nice and flat. I love how it looks in our kitchen, and it helps cover quite a few "mysterious" paint stains that no one seems to claim responsibility for. These corner blocks are probably my most favorite part. I think they add such a lovely touch of interest and playfulness. Now that the tablecloth is finished, you know what comes next, right? Oh, yeah! We need some new place mats. I'm thinking something like this or this would be wonderful. I started this quilt back in August!!! as part of Vintage Holiday quilt along. I was sort of on time making my blocks but once the quilt top was finished I got stuck. And, since I could not decide on the backing, or quilting, and Christmas was still months away, I just shoved it under a pile of other wips and there it sat, waiting its turn. I then came across this lovely quilter's flannel at Joann and thought it would make a perfect backing. It's wonderfully soft and I adore this shade of light blue. So pretty and bright. Once I decided on the backing, the whole quilt came together rather quickly. I love this sort of grid quilting, it adds so much texture, especially once the quilt is washed and dried.Oh, it feels great to have this quilt off my Christmas to do list. Finished size of this quilt is 54" x 68" (perfect for snuggling on cold winter evenings) and the pattern is by Camille Roskelley. Linking up to Crazy Mom Quits' Finish it up Friday. I love swaps. I really do. So, when my bloggy friend Kristie suggested we do our own private swap, I was all for it. I was making a pillow for Kristie (you know how much I love making pillows, right?) and she agreed to knit a honey cowl for me. Kristie's knitting is amazing, she is such a pro and I knew my cowl would be beautiful. Want to see? I love this charcoal yarn with some grey here and there. Definitely something I would have chosen for myself if I were a knitter, which I am not! Not only is it beautiful, it's also wonderfully warm and cozy. Just perfect for this crazy cold weather we've been having in the last couple of days. And, I already got quite a few compliments, from strangers by my kids' school, on how pretty it is. As if this beautiful cowl was not enough, Kristie sent me tons of other goodies, too. See that coveted mermaid fabric, yep all mine. Kristie also sent some Canadian chocolates which were in our tummies by the time I pulled my camera out (and yes, I did share). I just love her sense of humor. Thanks, Kristie! This was such a fun swap. Pictures of the pillow I made for Kristie coming up soon. After the hustle and bustle of preparation for the craft fair, I'm finally back to my regular sewing routine. And, it feels good. I spent quite some time over the last couple of evenings working on these churn dash blocks. They are not "my usual" colors, and that might be the reason why I find them so refreshingly different. I love how these darker colors accentuate the bold, graphic look of the churn dash block. I'm planning on using a 2" sashing in the same off white color to join the blocks, and I really need to start thinking about the back - not my favorite part at all. Any suggestions? I also made this pouch for myself. I needed a new one for my credit cards and money as the one I was using was about 2 years old and quite ugly looking by now. After seeing this wonderful pillow on Flickr I decided to give these Tallahassee blocks a try. Mine are tiny, only about 4" each and I paper pieced them using the free pattern found here. I used some of my very favorite fabric by October Afternoon for the flowers and went with this dark linen look alike for the main part of the pouch. I then did some simple hand stitching to outline the blocks and added a yellow zipper and red ribbon for some pop of color. And, to give credit where credit is due, my pouch was also inspired by this lovely pouch Chase made a while ago. Don't you just love the amazing amount of talent and inspiration all over the blogland? Linking up to Lee's WIP Wednesday. I love, love, love making and using little purses and pouches. So, when the chance came to take part in UR priceless blog hop, which meant making a perfectly adorable coin pouch using a metal sew in frame, I was totally in. Isn't it the sweetest? I've always admired all those pretty, chubby little pouches but could never figure out the gusset part. Whenever I tried making a metal frame pouch, it ended up being all flat and anemic looking. Not this baby, though. Thanks to Madame Samm and her amazing instructions, this pouch turned out just the way I hoped. It's adorably small, fits a 3" frame (I got mine here), and as chubby as can be. And, it was quite an easy pouch to sew. I'd say the most consuming part was attaching the frame. You can purchase the pattern for this little cutie here. Hope you give it a try. The craft fair is over, and I'm happy to get back to my regular sewing routine. But, before I do, I feel like the recap of the whole experience is totally in order. I was sharing a table with a friend of mine and here's what our display looked like (hers are the fabric buckets and coffee cozies on the right side). I must say, I thoroughly enjoyed putting it all together. As you can see, I concentrated mostly on smaller, low cost items like pouches, coasters, and Christmas ornaments. I also had a few pillows and Christmas stockings for sale, too. I managed to sell quite a few of my products, with little birdies Christmas ornaments being the most popular item. The highlight of the whole fair, however, was when I got to talk to some of my blog's readers who stopped by and introduced themselves. You ladies totally rock and I enjoyed talking to each and every one of you. I must admit, though, I'm quite glad the fair is over now. Working "sweatshop style" and having the time pressure to pump up many of the same or very similar product is just not my thing. All in all, I'm happy I had a chance to experience what selling at the craft fair is like, but it also made me realize that sewing things just because I want to and blogging about them is what I enjoy the most. Just two more days and I'm off to my first ever craft fair. Yay?!?! As I said before, I'm both excited as well as anxious about the whole thing. There are times when I think I have enough inventory and it will all go well. Then, there are times when I worry that I have too little, or even too much??? Nuts, I know. To help with my anxiety, I sewed. I made birdie Christmas ornaments. Aren't they the sweetest? I followed Kajsa's tutorial on how to make these tiny creatures. I love how they turned out and making them was a lot of fun. Plus, I got to use up some of my scraps. I think they will look sweet displayed on my very fluffy Christmas tree. My kids made it clear already that we need some of these birdies on our tree so I'm looking forward to making a lot more of them once the fair is over. I also made a few sets of coasters and suddenly the world seemed like a much better place. Phew! I definitely love this "sewing therapy". I have just three more sets of coasters to finish up, price and pack all my products, and I'll be ready. Fingers crossed. Linking up to AmandaJean's Finish it up Friday.